Matsuura MC-760V2 CNC Vertical Machining Center s/n 83012886 w/ Yasnac M5X Controls, 30-Station ATC, BT-40 Taper Spindle, 25-6000 RPM, 16” x 45” Table, Coolant. Mori Seiki SL-1A CNC Turning Center s/n 267 w/ Yasnac LX1 Controls, 12-Station Turret, Hydraulic Tailstock, 6 ½” 3-Jaw Power Chuck, 5C Collet Nose, Coolant. Erie 300 Ton 36” x 36” Bed Straight Side Deep Draw Press w/ 26” Stroke, 7” Shut Height, Custom 100 Ton Dual Piston Air Die Cushion, 300 Ton with 50Hp 2000 PSI Geroter Hydraulic Unit, Or 700 Ton with 50Hp 5000 PSI Denison Variable Volume Hydraulic Unit (Included but not currently in use), Manual Controls, 36” x 36” x 12” Bolster. Clearing USI 110 Ton Cap Back Geared OBI Stamping Press s/n 11- 5001 Press# HC-30- 37-30 w/ 8” Stroke, 18” Shut Height RDAU, 6” Ram Adj., 40 Strokes/Min, Air Cushion, Air Clutch, 30” x 42” Bolster Area, 27”x 42” Top Bolster Plate, 21” x 28” Ram Area. Multipress 4-Ton Hydraulic C-Frame Press w/ 11” x 18” Bolster. Clark & Lewis CL-200 Draw Type Rotary Hydraulic Tube Bender s/n 0317 w/ 2” Cap, 10’ Tube Length over Hydraulic Mandrel, Full POB and DBB Carriage, Digital Bend Control, 2” Centerline Tool Height, 4” Bend Cylinder, Left-Hand (Counter-Clockwise) Rotation, Low Hours, Original Factory Paint, Bend Tooling ½” to 3”. Addison McKee HFM-70 RF Ram Type Hydraulic Tube End Former w/Special Order 12” Horizontal Ram Stroke, Low Time, In As-New Condition. Dickey & Son mdl. 3 ½ Rotary Form Machine s/n 200-A- 10-15- 11-72 w/ 22” Out-Feed Clamping Spindle. Wysong 16GA x 52” Power Shear. Grand Rapids No. 480 12” x 30” 3-Way Automatic Surface Grinder w/ 12” x 31” Electromagnetic Chuck, Wheel Dresser, 14” Wheel Cap, Coolant. Jotes SPC-20b 8” x 20” 3-Way Automatic Hydraulic Surface Grinder s/n 5578 w/ 8” x 20” Electromagnetic Chuck, Wheel Dresser, Coolant. Nicholas Correa F3HA Universal Power Mill s/n 5320102 w/ 34-1700 Spindle RPM’s, Compound Vertical Head, 50-Taper Spindles, Power Feeds, Arbor Supports. True-Trace / Bridgeport Tracer Mill w/ True-Trace Synchro-Trace 180 Tracing Unit, Bridgeport Variable Speed Milling Head, 60-4200 Dial Change RPM, Chrome Box Ways, 11” x 58” Table, Tracing Tips. Moore Die Flipper w/ 22” x 40” Table, 14” x 40” Roll-Over Upper Platen, Integral Drill Press. Kattenbach mdl. KKS400NA Up-Acting 16” Automatic Hydraulic Miter Saw s/n 40566 w/ Hydraulic Clamping and Feeds, Drop-In Gripper and Clamp, Gripping Dies to 3” Cap. Grob mdl. 4V-18 18” Vertical Band Saw s/n 2527 w/ Blade Welder, 24” x 28” Table. Grob mdl. 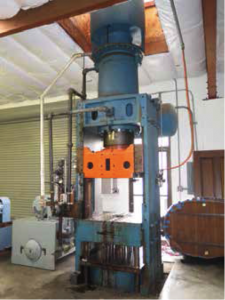 AB-18 18” Vertical Die Filer. Sunstrand Engelberg mdl. BG8/A 8” Wet-Dry Belt Grinder s/n 85028SE w/ Front Coolant Spray, 11” x 17 ½” Table. Porter Cable Type G8 8” Wet-Dry Belt Grinder s/n 1342. Airflow Systems mdl. DT3000-PG7- VP 44” x 66” Down-Draft Table s/n 1003276 w/ Internal Filtration. Airflow Systems mdl. DT3000-PG7- B1 44” x 66” Down-Draft Table s/n DT1097 w/ Internal Filtration. Curtis 5Hp Horizontal Air Compressor w/ 80 Gallon Tank. Peerless 200,000 BTU Gas Fired Heater. Miller Syncrowave 300 CC-AC/DC Arc Welding Power Source s/n JH223019 w/ Pulsing Feature. Air Products (Private Branded Miller Syncrowave) mdl. THFC-300J55 300 Amp AC/DC Gas Tungsten-Arc or Shielded Arc Welding Power Source w/ Quick Change Torch Mechanism, Double Boom. Air Products (Private Branded Miller) mdl. THF250ECP 250 Amp AC/DC Gas Tungsten-Arc or Shielded Arc Welding Power Source s/n HG021635 w/ Double Torch Boom. Acme Style AP mdl. P TOP-6- 50 50 kVA Circumferential Seam Welder w/ Robotron Sentry-3 Controls, 6” Throat. Kimura Denyoki mdl. SW-605P 60 kVA x 24” Spot Welder Kimura Denyoki Controls. Federal Type RE1-24 15 kVA x 22” Rocker Arm Spot Welder s/n 12814. Lista 8-Drawer and (2) 9-Drawer Tooling Cabinets. Skill mdl. 443 Magnetic Base Drill. Mitutoyo B-231 CMM Machine s/n 8202275 w/ Mitutoyo 3-Axis DRO. Mitutoyo TNM-101 Tool Makers Microscope. Over 7600 Feet of Stainless Steel Tube Stock Including 321 Stainless 1.625”, 1.75”, 2.0”, 304L Stainless 1.5”, 1.625”, 1.75”, 2.0”, 304 Stainless .5”, .875”, 2.25”, 2.5”, 3.0”.